Danny was born in Brisbane, Queensland, Australia. His family moved to Mudgeeraba on the Gold Coast when he was 4 years old, where his famous father 'Wallaby' Bob McMaster was mine host at the equally famous "Wallaby Hotel" for the next 27 years. His first big love: comedy, was never too far away from his thoughts. "I was going to be the next Danny Kaye." But, it was the impressionists who fascinated him. "How do you change your voice like that?" Performing in Talent Quests, in 'live' situations, as well as TV shows, was a hoot as an amateur dabbling with impressions and music throughout the 70's. He turned pro in 1980 and hasn't looked back since. He has performed on every major TV show in Australia throughout the 80's and 90's and was the voiceover expert on the Nine Network's "Australia's Funniest Home Video Show" for nine years from 1991-99 working with Jackie McDonald, JoBeth Taylor, Catriona Rowntree, Kim Kilbey and Lisa Patrick. His love of Rugby League, The Greatest Game Of All, led him to writing and recording "The Rugby League Song" in 1980 and it has stayed in the sporting lexicon as a perennial tribute ever since. In fact, he is somewhat a sports afficianado having written & recorded tributes to the Australian Rugby Union team with "I Wanna Be A Wallaby" & a rousing anthem to the Queensland State-Of-Origin team with "Queenslander!" He has shared the stage with various big-names as Mary Wilson ("The Supremes"), Don McLean ("American Pie"), Glenn Shorrock ("Little River Band"), The Barron Knights (UK), Col Elliott (legendary Oz comic) and Sammy Davis Jnr., to name but a few. He has worked the great showrooms, five-star hotels, pubs and clubs of Australia, VietNam, New Zealand, New Guinea, Hong Kong, Japan, Tahiti, Fiji & the USA in New York, Chicago, Washington, Florida, Pennsylvania and Las Vegas, Nevada, in front of politicians, heads of industry, the public and his peers. 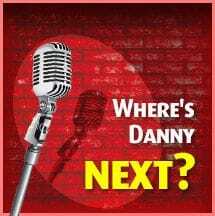 A polished performer and raconteur, Danny wants to do it for many years to come and he's well on his way to 'doing it all'. It was a gradual thing. At the age of 15, what was supposed to be a serious speech at school as part of a Public Speaking course, well, I couldn't keep it serious. A year later at my brother's 21st birthday party, I had memorised a whole Bill Cosby album and people laughed in all the right places. That was cool. I tried a lot of 'serious' jobs and eventually found out I wasn't qualified for any of them. So I thought, "Let me have a go at that 'unserious' thing and see how that works out." When people say, "I haven't had a good laugh like that in quite a while." I love it when an audience has belly laughs. In my collection there is music from hard rock to country, comedy albums from all over the world. There is vinyl and they are played occasionally, also an extensive karaoke collection too. But, it has to be said my favourites are The Rat Pack especially the King Of Cool, Dean Martin. Parties at our place, there's somethin' for everybody. Mate, I could write a book on it. Been through the mill in everything showbusiness has to offer but I don't embarrass easily, if in fact at all. I just get over it real quick. I've been booed off stage, the power's gone out mid-performance, had an audience give me "not one laugh, not one!" and yes, even had the old fly-undone-and-no one- told me-trick. The list goes on. There's been a lot of 'proud moments' whether it's working with famous people and not-so-famous people, but, I'm most proud of the fact I can get through a show no matter what happens. I'm talking about being sick or overcoming and adapting to circumstances that crop up whether it's my doing or someone else's. My inspiration or influences have come from a lot of sources. Biographies are my favourite books. Relatives, friends, colleagues, acquaintances, the general publicthey all have an effect on me. As an impressionist, I would say Frank Gorshin was easily the most entertaining and interesting to watch. My idea of a great holiday would be going to the races with my family and friends, later that night to a big rugby league match; the next day playing 18 holes on a championship golf course with my mates and then the rest of the afternoon at the clubhouse barhang onthat's not a holiday, that's my fantasy weekend, 'cause I'd need a deserted beach resort for the next week to recover. Dreams are wonderful things. Come to think of it, that could very well happen. Be careful of what you wish for. What is the most important lesson you have learnt in life? Always listen to what Dr. Phil says and then do the opposite. It may not be the right thing but it will always make life just that little bit more interesting. I kid, I kid. The most important lesson or lessons in life are easy to 'live', the hard part is accepting that. Just remember this: it's YOUR choices that determine the path of your life. SERIOUSLY (and this is the only serious thing I'm going to say): finish what you start. Think about it. If you were stranded on a desert island, what three things would you take with you and why? A beautiful intelligent companion; a set of golf clubs so we could play a two-some and get much needed bunker practice; a good supply of Bundaberg Rum. Yum. What animal do you most resemble and why? What is one thing you would like to achieve in the future? Long qualitative life would be nice. And to see the end of the "Rugs-A-Million Sale". What movie or song puts a lump in your throat? "The Family Guy" theme song. When Brian and Stewie hit that last note together, I just well up. The eastern end of Cavill Avenue used to empty out onto Surfers Paradise beach with the sand on the street and I can still smell the hamburgers at the kiosk there. Which celebrity would portray you in a movie about your life? What is the most bizarre thing you have ever seen? I don't know if this actually qualifies as bizarre or not but I once saw Stevie Wonder walking around in a building on his own. It was in LA in 1987, 2.00AM, me and my mate had gone downstairs to get some soft drinks in the foyer of the hotel we were staying in. Out steps Stevie from the elevator and starts to walk through the lobby. My first reaction was, "That's Stevie Wonder, don't stare at him." I'm just star-struck and it took me fully a minute to think, "Hang on, he's blind!" There was a series of security doors between him and the entrance and his bodyguard was banging on the outside glass door, I could see his gun showing as his coat opened up. I thought, "He can't see you mate but I'm sure he hears you." How he negotiated from his room to the foyer I'll never know, and we asked to help him but he just said, "No, I'm fine." They let the bodyguard in and he was going 'beresk', "What're you doing just walking around, man?!" Stevie was just laid-back, "I know my way around. I'm not a baby." Quite strange the whole thing. I was supporting Jade Hurley at Seagulls once when, totally unplanned and definitely not in the show at all, I thought it would be a good idea to dress up as 'Arthur Dunger', a Paul Hogan character, and carrying a lit candelabra and a coolite esky, run in exaggerated slow motion across the front of the stage in front of him while he was playing "Chariots Of Fire". I'd stop at his piano and open the esky and pull out a beer, snap the lid spraying grog everywhere, skull it and then slow-motion it off stage. He didn't stop playing, didn't phase him one bit but the audience were cacking themselves. I did it three nights in a row, each time he thought I wouldn't do it again and each time I would do a little bit more funny business. Good times. 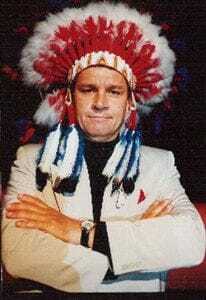 Bundy. Sometimes I get reaaalllly comfortable. The bass volume in other people's cars. Their toenails must be vibrating. Dean Martin and Jerry Lewis are still the funniest thing I've ever seen. The Marx Brothers, Jackie Gleason, The Ed Sullivan Show, Morecombe & Wise, The Two Ronnies, Benny Hill, Paul Hogan, Frank Gorshin, Rich Little, Jonathan Winters, Red Skelton, Tim Conway, Tim Allen, Dave Allen, Steptoe & Son, Billy Connolly, The Goon Show, Monty Python, Fawlty Towersand many others have had a profound effect on my professional life. My Australian contemporaries have had a great influence and joyful inspiration to me: Don "Big Daddy" Martin, Barney Coombs, Syd Heylen, Slim DeGrey, Johnny Garfield, Brian Doyle, Col Elliott, Rodney Rude, Kevin 'Bloody' Wilson and Paul Martellthe list goes on today. Dean Martin was the coolest performer: straight man, actor, TV host and singer. "Ready when you are, pally."